Relatively speaking, congenital duodenal atresia is one of the more common intestinal anomalies treated by pediatric surgeons, occurring 1 in 2500-5000 live births. In 25-40% of cases, the anomaly is encountered in an infant with trisomy 21 (Down syndrome). The definitive intervention to correct the anomaly is surgical and consists of duodenoduodenostomy in the newborn period. Duodenal obstruction may be complete or incomplete. See the images below. Incomplete duodenal obstruction (duodenal stenosis). Duodenal atresia is an example of complete intrinsic obstruction. Duodenal stenosis is an example of an incomplete intrinsic abnormality; however, duodenal extrinsic stenosis can occur in association with malrotation or a preduodenal portal vein. Strictly speaking, annular pancreas does not cause an extrinsic duodenal obstruction because the duodenum within the collar of an annular pancreas is intrinsically narrowed. Duodenal atresia can take many forms, but proximal and distal intestinal segments always end blindly. The intestine on either side of the defect may be in apposition (type 1), separated by a fibrous cord (type 2), or gap (type 3). 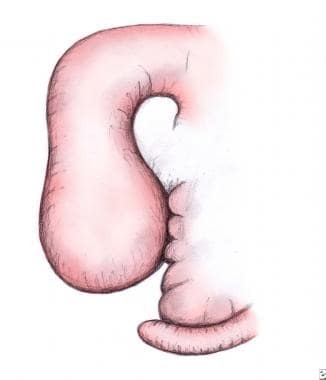 Regardless of atresia severity, the proximal intestinal segment is typically dilated and the distal segment empty; these are hallmarks of duodenal atresia. Although obstruction may occur anywhere within the duodenum, it is most common in the vicinity of the ampulla of Vater. Reported incidence rates range from 1:2,500 to 1:40,000 live births; published rates in the United States and internationally do not appear to differ. Duodenal atresia is not usually regarded as a familial condition, despite isolated reports of this condition in multiple siblings. Duodenal maldevelopment occurs secondary to either inadequate endodermal proliferation (gut elongation outpaces proliferation) or failure of the epithelial solid cord to recanalize (failure of vacuolization). Multiple investigators have demonstrated that the epithelium of the duodenum proliferates during 30-60 days' gestation, completely plugging the duodenal lumen. A subsequent process termed vacuolation occurs whereby the solid duodenum is recanalized. Vacuolation is believed to occur by way of apoptosis, or programmed cell death, which occurs during normal development within the lumen of the duodenum. Occasionally, duodenal atresia is associated with annular pancreas—pancreatic tissue that surrounds the entire circumference of the duodenum. This is likely due to failure of duodenal development rather than robust and/or abnormal growth of the pancreatic buds. At the cellular level, the GI tract develops from the embryonic gut, which is composed of an epithelium derived from endoderm, surrounded by cells of mesodermal origin. Cell signaling between these two embryonic layers appears to play a critical role in coordinating patterning and organogenesis of the duodenum. Sonic hedgehog genes encode members of the Hedgehog family of cell signals. Both are expressed in gut endoderm, whereas target genes are expressed in discrete layers in the mesoderm. Mice with genetically altered sonic hedgehog signaling display duodenal stenosis, which suggests that genetic defects in the sonic hedgehog family of genes may influence the development of duodenal abnormalities. Duodenal atresia is a disease of newborn infants. Cases of duodenal stenosis or perforated duodenal web (diaphragm) rarely remain undiagnosed until childhood or adulthood; these cases represent the exception rather than the rule. Duodenal atresia appears to be equally distributed between infants of both sexes, with no reported predilection for one race. Presenting symptoms and signs are the result of high intestinal obstruction. Duodenal atresia is typically characterized by onset of vomiting within hours of birth. While vomitus is most often bilious, it may be nonbilious because 15% of defects occur proximal to the ampulla of Vater. Occasionally, infants with duodenal stenosis escape detection of an abnormality and proceed into childhood or, rarely, into adulthood before a partial obstruction is noted. Nevertheless, one should assume any child with bilious vomiting has a proximal GI obstruction until proven otherwise, and further workup should be begun expeditiously. Once delivered, an infant with duodenal atresia typically has a scaphoid abdomen. One may occasionally note epigastric fullness from dilation of the stomach and proximal duodenum. Passing meconium within the first 24 hours of life is not usually altered. Dehydration, weight loss, and electrolyte imbalance soon follow unless fluid and electrolyte losses are adequately replaced. If intravenous (IV) hydration is not begun, a hypokalemic/hypochloremic metabolic alkalosis with paradoxical aciduria develops, as with other high GI obstruction. An orogastric (OG) tube in an infant with suspected duodenal obstruction typically yields a significant amount of bile-stained fluid. Although duodenal atresia is a surgically treated disease, operating on an infant with duodenal obstruction in the middle of the night is unnecessary. Only 2 limitations apply to timing the repair: stabilization of the fluid and electrolyte balance and exclusion of overwhelming congenital defects that would preclude use of a general anesthetic (ie, complex congenital heart disease). Correction can begin any time after these issues are addressed and optimized. Relevant anatomy of duodenal atresia is addressed in Problem. Contraindications to immediate repair include electrolyte or fluid balance disturbances; severe cardiac defects, which should be repaired prior to addressing the duodenal abnormality; and severe respiratory insufficiency that would preclude a safe operation. Infants can be maintained on orogastric OG suction and intravenous nutrition with aggressive repletion of fluid and electrolyte losses while these life-threatening issues are addressed. Freeman SB, Torfs CP, Romitti PA, et al. Congenital gastrointestinal defects in Down syndrome: a report from the Atlanta and National Down Syndrome Projects. Clin Genet. 2009 Feb. 75(2):180-4. [Medline]. Piper HG, Alesbury J, Waterford SD, Zurakowski D, Jaksic T. Intestinal atresias: factors affecting clinical outcomes. J Pediatr Surg. 2008 Jul. 43(7):1244-8. [Medline]. AppleBaum H, Lee SL, Puapong DP. Duodenal atresia and stenosis - annular pancreas. Grosfeld, O’Neill, Fonkalsrud, and Coran. Pediatric Surgery. Philadelphia, PA: Mosby Elsevier; 2006. 1260-1268. Aubrespy P, Derlon S, Seriat-Gautier B. Congenital duodenal obstruction: a review of 82 cases. Prog Pediatr Surg. 1978. 11:109-24. [Medline]. Alatas FS, Masumoto K, Esumi G, Nagata K, Taguchi T. Significance of abnormalities in systems proximal and distal to the obstructed site of duodenal atresia. J Pediatr Gastroenterol Nutr. 2012 Feb. 54(2):242-7. [Medline]. Akinloye OW, Truong W, Giacomantonio M, Mateos D, El-Naggar W. Coexistence of meconium ileus with duodenal atresia and trisomy 21 in a newborn: a case report. J Perinatol. 2014 Nov. 34(11):875-6. [Medline]. Haeusler MC, Berghold A, Stoll C, et al. Prenatal ultrasonographic detection of gastrointestinal obstruction: results from 18 European congenital anomaly registries. Prenat Diagn. 2002 Jul. 22(7):616-23. [Medline]. Hancock BJ, Wiseman NE. Congenital duodenal obstruction: the impact of an antenatal diagnosis. J Pediatr Surg. 1989 Oct. 24(10):1027-31. [Medline]. van der Zee DC. Laparoscopic repair of duodenal atresia: revisited. World J Surg. 2011 Aug. 35(8):1781-4. [Medline]. [Full Text]. Rosales-Velderrain A, Betancourt A, Alkhoury F. Laparoscopic repair of duodenal atresia in a low birth weight neonate. Am Surg. 2014 Sep. 80(9):834-5. [Medline]. Li B, Chen WB, Zhou WY. Laparoscopic methods in the treatment of congenital duodenal obstruction for neonates. J Laparoendosc Adv Surg Tech A. 2013 Oct. 23(10):881-4. [Medline]. Ghaffarpour N, Svensson PJ, Svenningsson A, Wester T, Mesas Burgos C. Supraumbilical incision with U-u umbilicoplasty for congenital duodenal atresia: the Stockholm experience. J Pediatr Surg. 2013 Sep. 48(9):1981-5. [Medline]. Balakumar V, DeRoss AL, Kouretas PC, Boulanger SC, Barksdale EM. 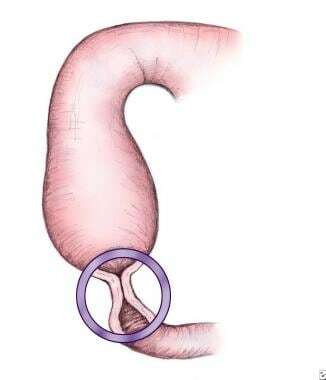 Pyloric exclusion for treatment of complicated duodenal atresia. Neonatology. 2014. 105(4):263-6. [Medline]. Fonkalsrud EW, DeLorimier AA, Hays DM. Congenital atresia and stenosis of the duodenum. A review compiled from the members of the Surgical Section of the American Academy of Pediatrics. Pediatrics. 1969 Jan. 43(1):79-83. [Medline]. Adzick NS, Harrison MR, deLorimier AA. Tapering duodenoplasty for megaduodenum associated with duodenal atresia. J Pediatr Surg. 1986 Apr. 21(4):311-2. [Medline]. Ein SH, Shandling B. The late nonfunctioning duodenal atresia repair. J Pediatr Surg. 1986 Sep. 21(9):798-801. [Medline]. Soutter AD, Askew AA. Transumbilical laparotomy in infants: a novel approach for a wide variety of surgical disease. J Pediatr Surg. 2003 Jun. 38(6):950-2. [Medline]. Takahashi Y, Tajiri T, Masumoto K, Kinoshita Y, Ieiri S, Matsuura T, et al. Umbilical crease incision for duodenal atresia achieves excellent cosmetic results. Pediatr Surg Int. 2010 Oct. 26(10):963-6. [Medline]. Rothenberg SS. Laparoscopic duodenoduodenostomy for duodenal obstruction in infants and children. J Pediatr Surg. 2002 Jul. 37(7):1088-9. [Medline]. Spilde TL, St Peter SD, Keckler SJ, Holcomb GW 3rd, Snyder CL, Ostlie DJ. Open vs laparoscopic repair of congenital duodenal obstructions: a concurrent series. J Pediatr Surg. 2008 Jun. 43(6):1002-5. [Medline]. Escobar MA, Ladd AP, Grosfeld JL, et al. Duodenal atresia and stenosis: long-term follow-up over 30 years. J Pediatr Surg. 2004 Jun. 39(6):867-71; discussion 867-71. [Medline]. Grosfeld JL, Rescorla FJ. Duodenal atresia and stenosis: reassessment of treatment and outcome based on antenatal diagnosis, pathologic variance, and long-term follow-up. World J Surg. 1993 May-Jun. 17(3):301-9. [Medline]. Spigland N, Yazbeck S. Complications associated with surgical treatment of congenital intrinsic duodenal obstruction. J Pediatr Surg. 1990 Nov. 25(11):1127-30. [Medline]. Upper GI contrast study following laparoscopic duodenal atresia repair. No leak is present, and an open anastomosis is shown. The white arrow highlights the anastomosis, which was performed using u-clips.